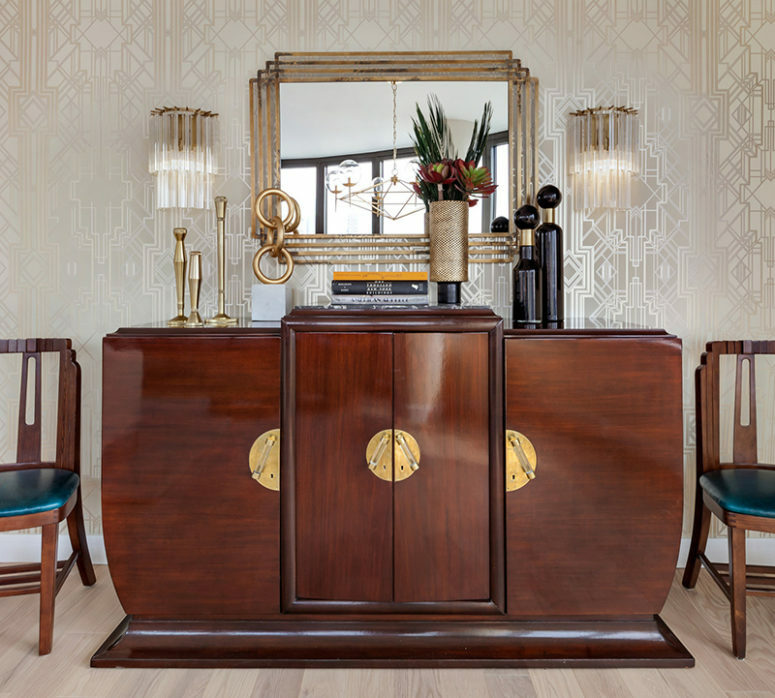 Interior designer Allison Lind creating the interiors of this apartment showed art deco style at its finest! Let’s have a look how to pull off this style with colorful details in a chic way. 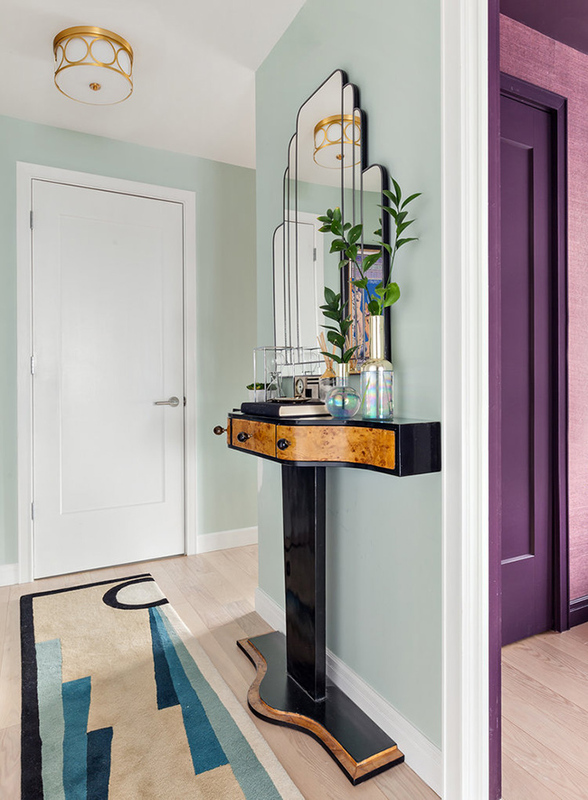 The entryway shows the idea of the decor: there’s a gorgeous console table of a very eye-catchy shape, it’s navy and gold, and a cool shaped mirror over it. 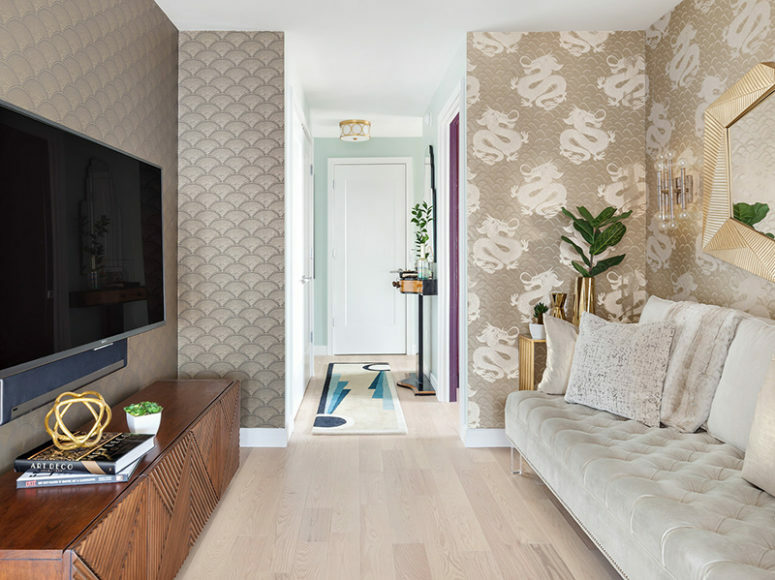 A geometric rug on the floor continues the theme of the decor. 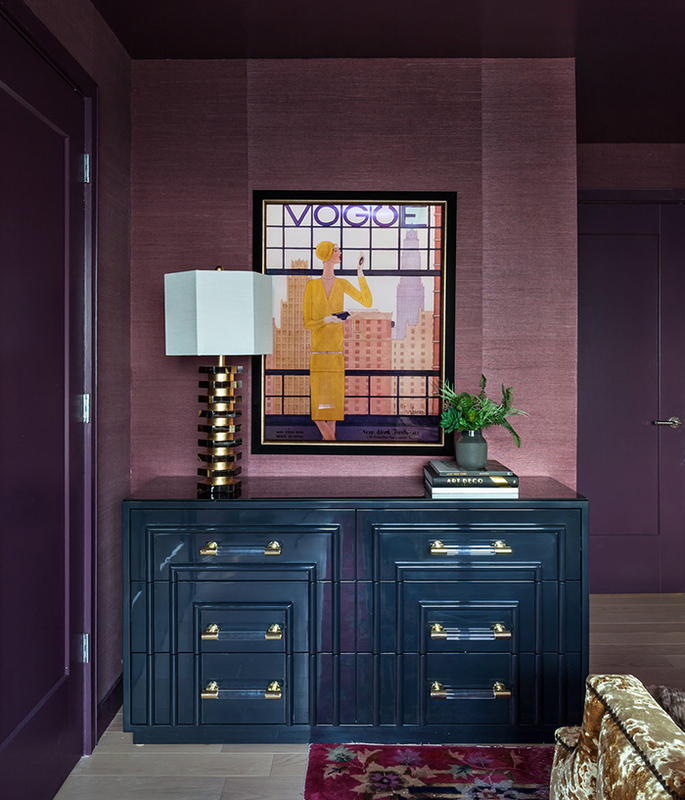 The most jaw-dropping space in this apartment is the master bedroom, which is done in an amazing purple shade. 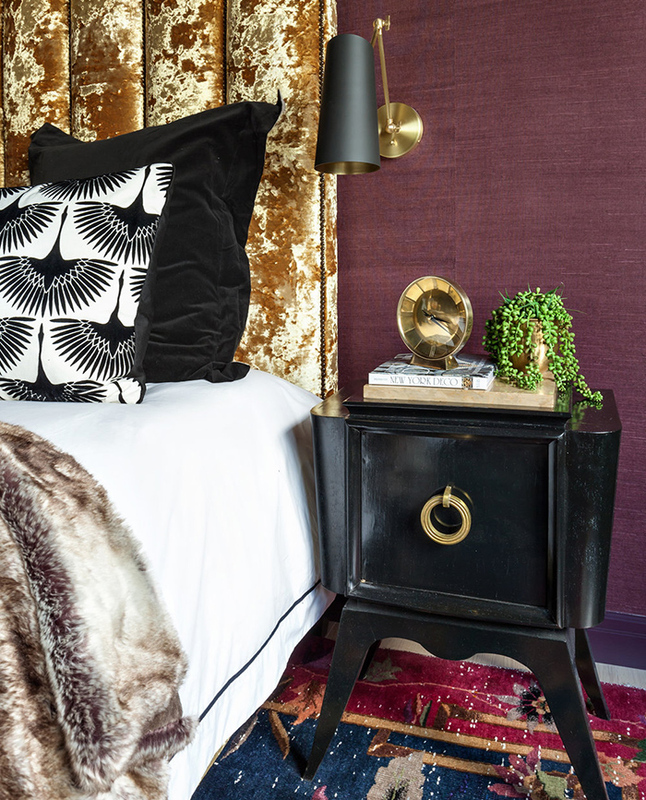 A stunning crushed gold velvet bed just excites and amazes at the same time – this striking contrast is wow! 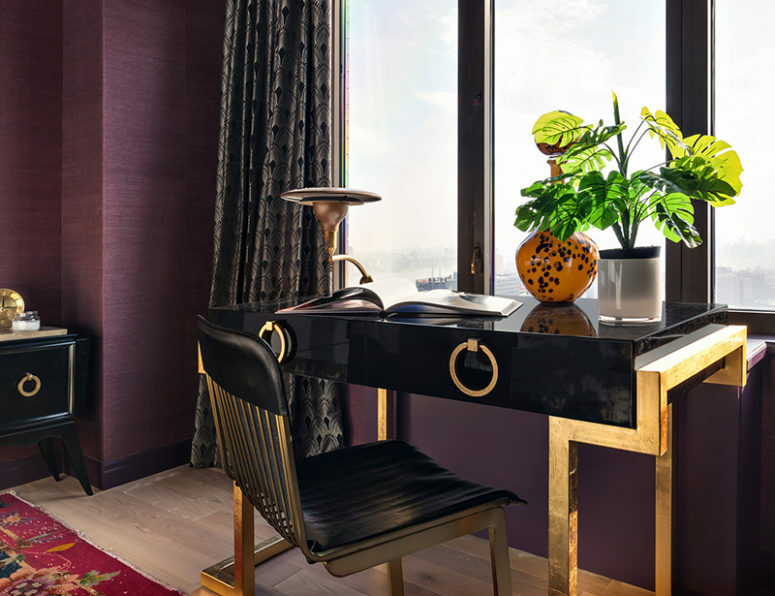 You can also see a geometric black and gold desk at the window and matching black nightstands. 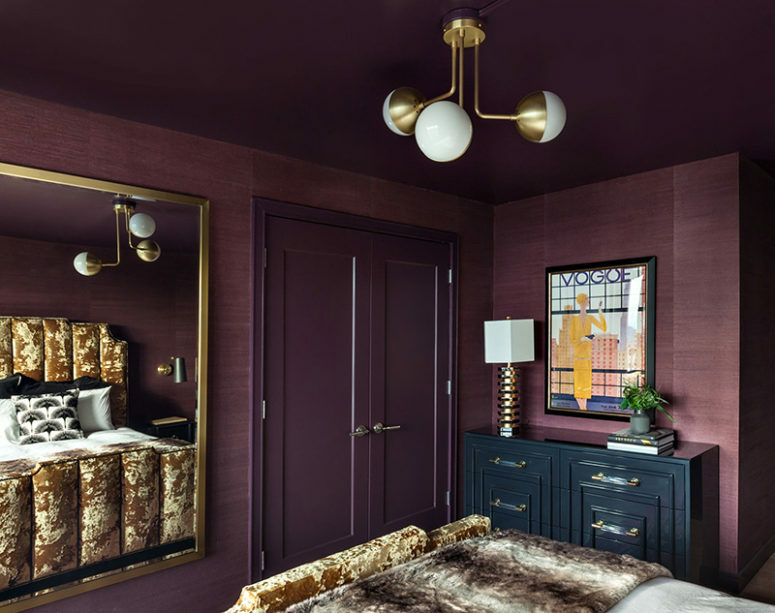 Various brass touches here and there add a glam feel to the space. The living room isn’t big but it’s hidden with the help of light shades used for decor. 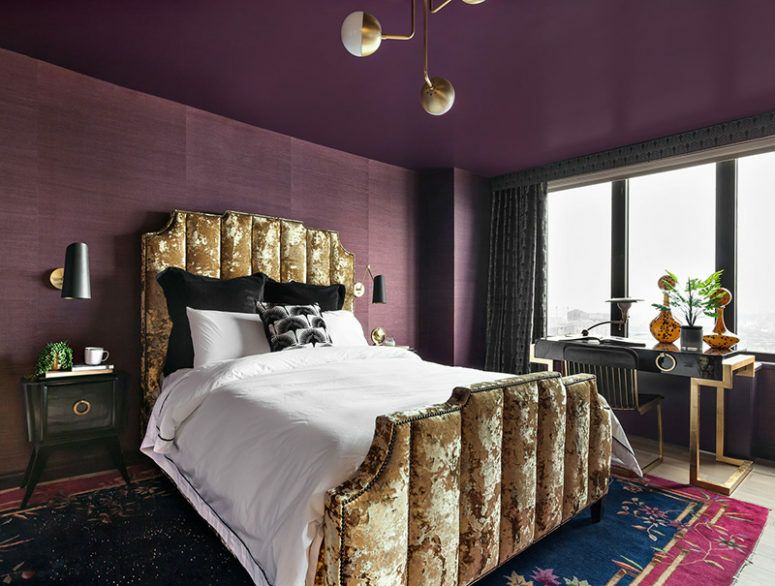 The opposite walls are covered with two different types of wallpaper, with very interesting prints. 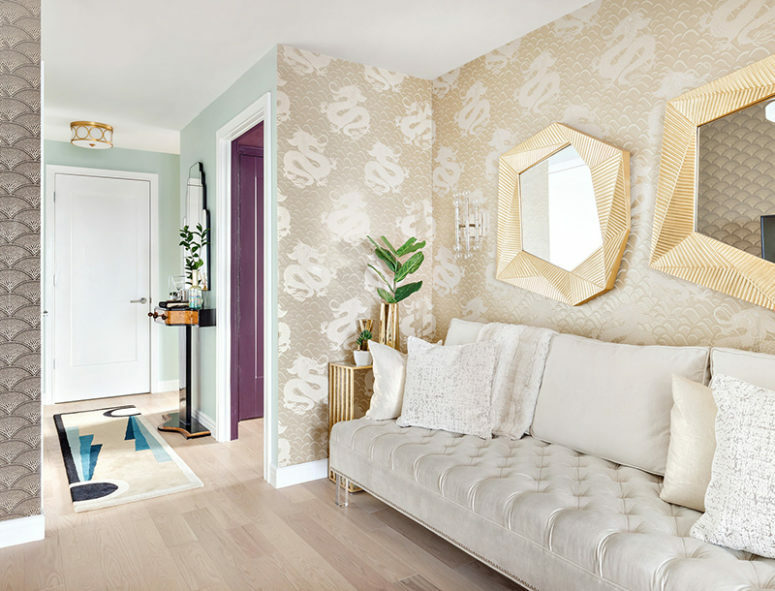 There’s a gorgeous creamy velvet sofa on acrylic legs and gold geometric mirrors. 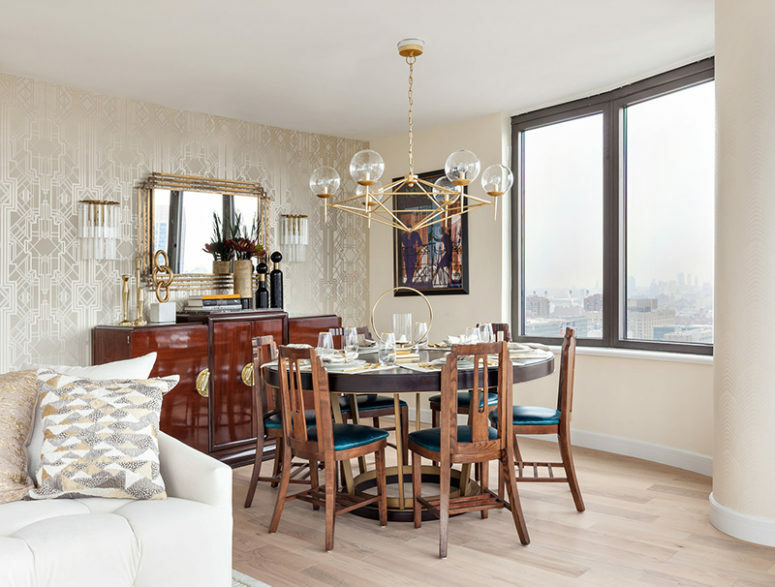 The next room is a rounded dining room and salon in one. 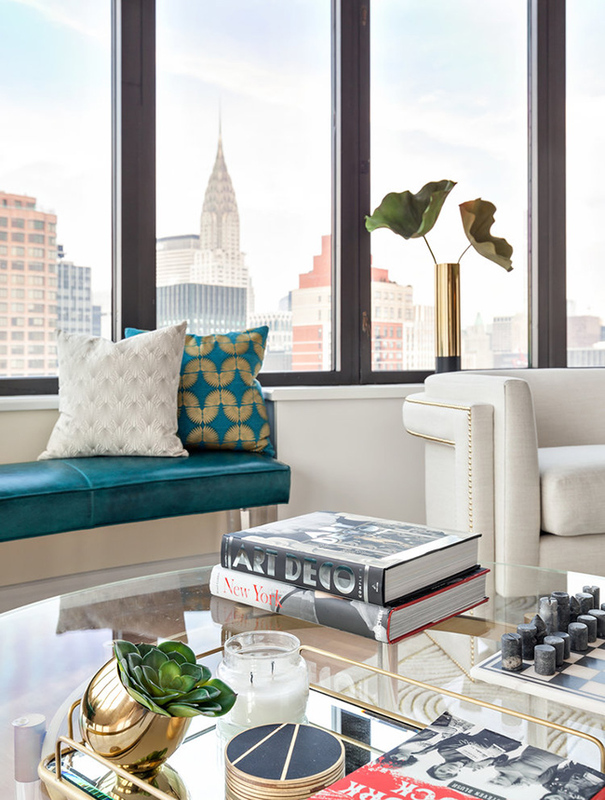 A gorgeous neutral space is made more vibrant with a teal leather bench by the window and a saturated wood dining set with a round table. 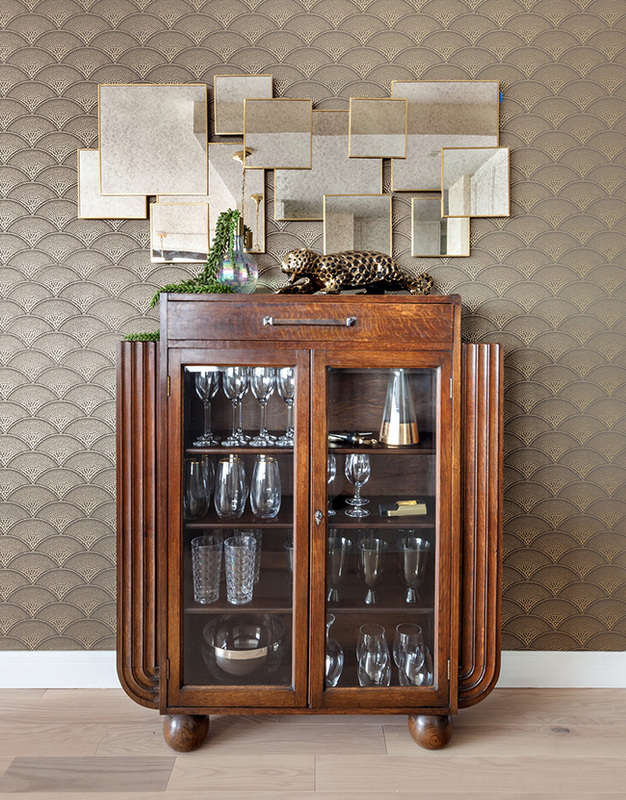 An eye-catchy art deco wooden bar cabinet with brass touches is a cool item to spruce up the space. 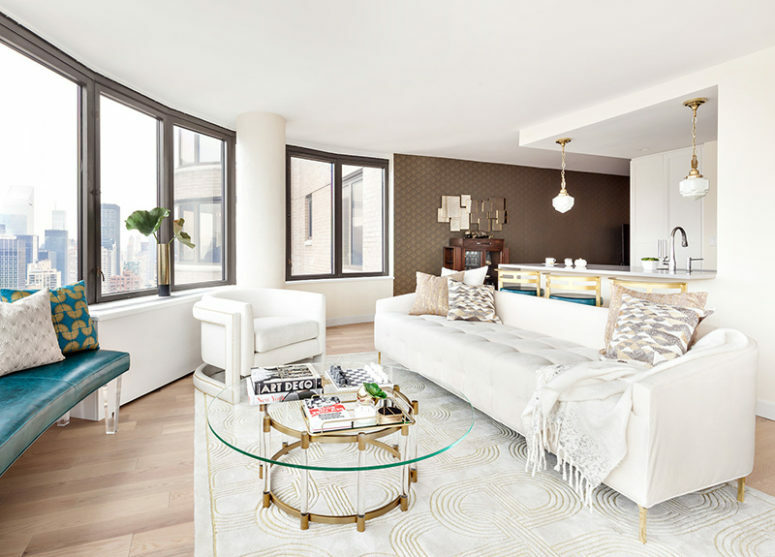 Look at all the stunning pics of this jaw-dropping space below!